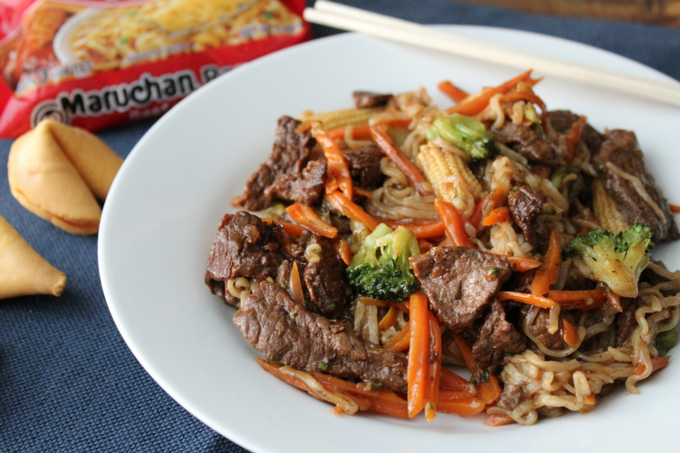 Sometimes you just get a craving for a great stir fry and this has always been my go to. 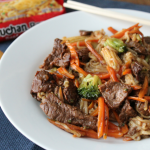 Tender lean beef, loaded with veggies, combined with ramen noodles makes College Beef Stir Fry a quick and healthy meal for a weeknight dinner. I think of ramen…. I think of college. Who doesn’t? Late night study sessions make you hungry and what is a poor college student to do when they want to put in minimal effort in making something to eat? Ramen. Starting my sophomore year of college, I moved into an on campus apartment with some friends I had grown close to my first year in Lincoln. 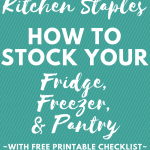 We all came from a farm background and would regularly stock our college kitchen with steaks and roasts “stolen” from our parent’s personal freezers filled with home raised beef. So this stir fry has always reminded me of that time. Another confession. Hi! I am Chanda and at twenty something still struggle to eat my veggies. I do. I mean I know there are all those health benefits, but dang they are usually boring and I find most of the time they become an afterthought when I am preparing dinner. But disguising them into the meal is a great way to make sure to hit the daily vegetable count. 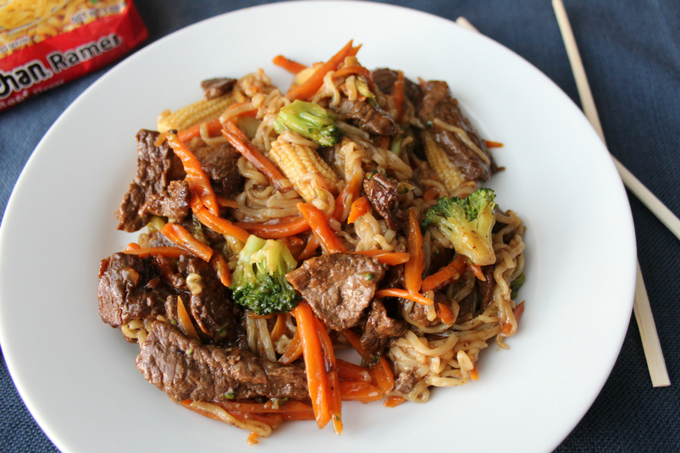 Like most stir frys, you can pick and choose the vegetables to fit your family’s taste. I always like using carrots, broccoli, and baby corn. But onions, peppers, or snow peas would be a great substitution or addition. 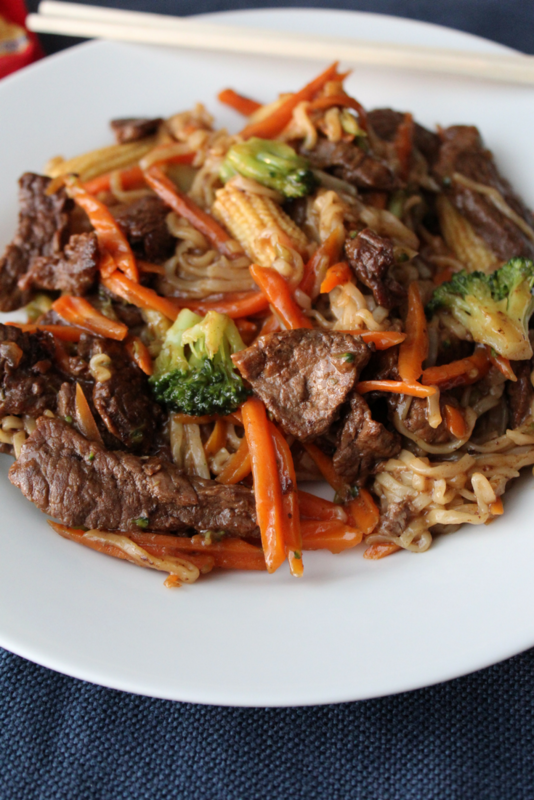 Beef gives the stir fry such great flavor. I use slices of sirloin most of the time, but have also substituted in flank steak or skirt steak. Any cut would work. Just make sure to slice the beef against the grain in very thin strips. This helps ensure that you will have a tender slice of beef. Tip: Put your steak in the freezer for an hour, it firms the surface and helps get great thin slices. 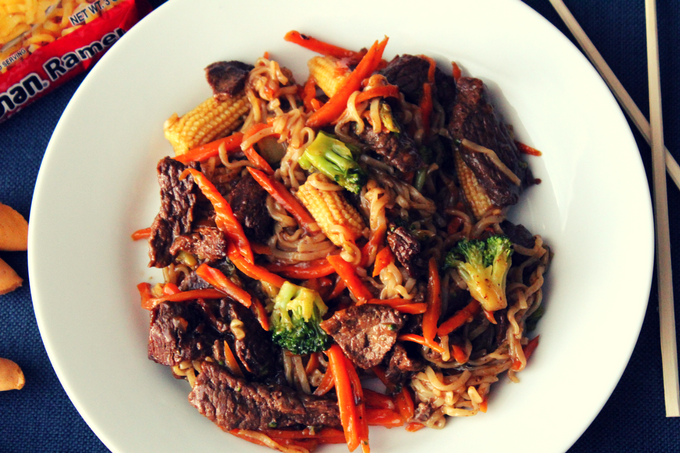 So the next time you get a craving for some delicious beef stir fry, make this version and you won’t be disappointed. In a large skillet, brown beef slices in the oil over medium-high heat. Depending on the size of your pan you may need to work in batches. Once all of the beef is browned, add the soy sauce to the beef and stir until liquid has evaporated. Remove beef from pan and keep warm. To the skillet, add the vegetables, 1 3/4 cups beef broth, and the two seasoning packets from the ramen noodles. Stir and cook for 6-8 minutes until vegetables are tender, but still have some bite. Combine the remaining 1/4 cup beef broth with cornstarch to make a slurry. Add to skillet with vegetables. Stir until liquid has thickened. Add beef and ramen to vegetables. Stir to combine and heat through.